Please Note: The screen shots accompanying this review come from the DVD portion of Cinerama Holiday. Vegas roulette tables and slot machines, Parisian can-can girls, ice capades, a county fair, yodelers, hotshot Navy pilots - viewing the 1955 production Cinerama Holiday is like being part of a schizophrenic slide show at your senile grandparents' home. This beautifully photographed widescreen travelogue is very quaint and of-its-time, yet the sheer magnitude of it still has the power to astonish. 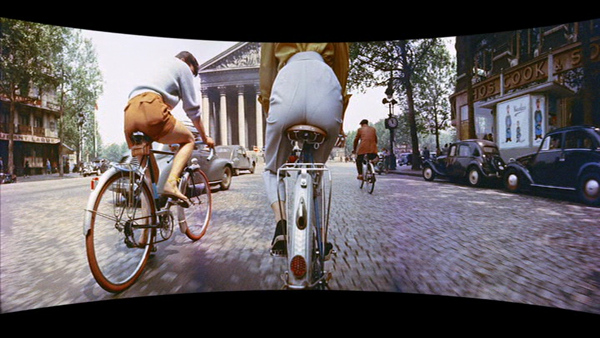 As a demonstration of what widescreen cinema was capable of, it can't be beaten. Like their previous releases This Is Cinerama and Windjammer, Flicker Alley's Blu Ray edition of Cinerama Holiday replicates the original feel of seeing this gala production as closely as possible. 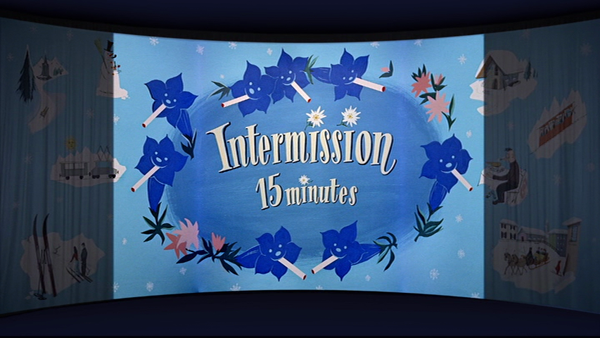 That includes preserving the "roadshow" experience of having composer Morton Gould's intro, intermission and outro music, and the pomp of the big, big screen revealed with the unfurling of a giant curtain (which giddily reminded me of seeing Star Wars as a kid at Phoenix's now-defunct deluxe theater, the Cine-Capri). The package even includes a mini reproduction of the program book which 1955 filmgoers could take away as a souvenir. Nice! As the second Cinerama production, Cinerama Holiday is guided by the principal of doing a bigger and better version of 1952's This Is Cinerama. Like the earlier film, it opens with a standard-format black and white prologue explaining its central premise - sending a typical young American couple on a European sight-seeing tour, and vice versa. After the film expands to full color and widescreen proportions (a still-impressive switcheroo which undoubtedly wowed the 1955 audience), we briefly get to know the participants - John and Betty Marsh of Kansas City, Missouri and Fred and Beatrice Troller of Zurich, Switzerland - before they get jetted off to their destinations for a few weeks of glamorous 1950s travel. Except for a few stilted, acted-out scenes, we don't really get to know the participants. By and large, they serve as regular-folk narrators for a panoply of travel imagery which plays like a vintage issue of Holiday magazine set in motion. While Fred and Beatrice pilot a scooter around the deserts of Arizona, San Francisco and Las Vegas (which looks amazingly different from today), John and Betty partake in bobsledding and skiing in the Swiss Alps - and so on. 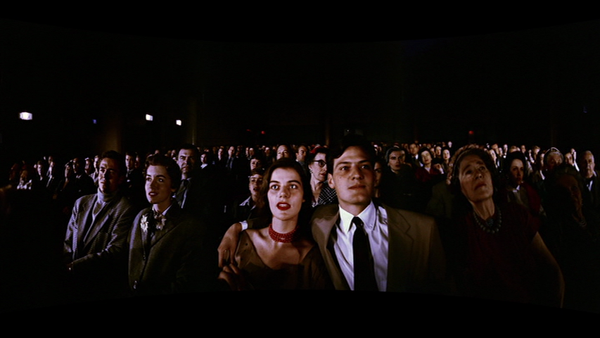 A few of the segments recreate the high-velocity thrills of This Is Cinerama. The placid landscapes and peeks into everyday life that make up much of it have a potent, nostalgic effect. Many scenes depict things that have gone the way of yester-land (the glass-topped compartment on the California Zephyr train; a tour through the Louvre with the Mona Lisa displayed like any other painting), while others have a wistful feel that borders on suspiciously phony (sunny scenes of daily life in a strangely underpopulated Paris). 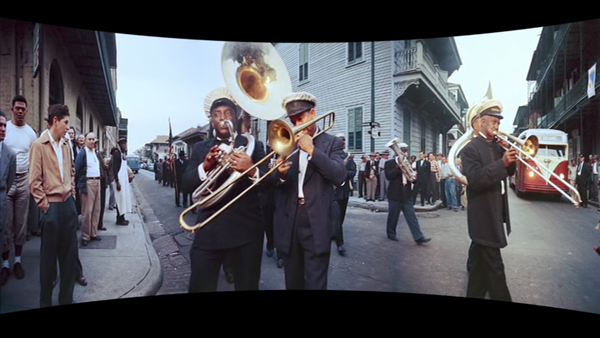 The narrated travelogue format is enthralling and works surprisingly well in the Cinerama format. The only flaw is that, while Fred and Beatrice go just about everywhere in the U.S. (leading to some delightful segments, such as New Orleans), John and Betty are strictly confined to the Swiss Alps and Paris. Cinerama Holiday concludes on an odd note, with the couples reunited in New York to view a film at Manhattan's own Cinerama-equipped theater. In this film-within-a-film sequence, we partake of scenes with the Navy's Blue Angels piloting their jets from a base in Florida to an aircraft carrier floating in the Atlantic. Pretty interesting overall, yet a baffling (and seemingly tacked-on) way to close out this travelogue. A few months after Cinerama Holiday's premiere, the Disney studio exhibited their own surround-cinema process at the newly opened Disneyland. 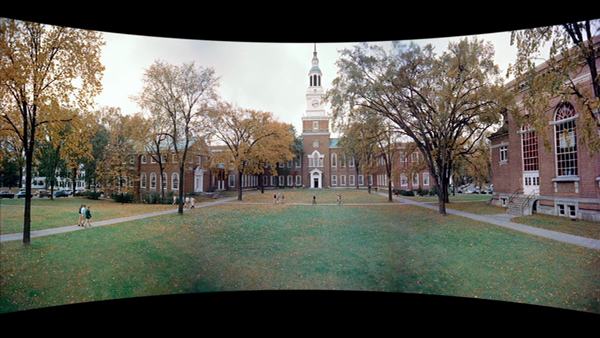 While Cinerama used three films projected on concave giant screen, CircleVision took an ever-more elaborate route with nine films projected in a 360-degree circle. Their first effort, America the Beautiful, shares a lot of the same folksy qualities with Cinerama Holiday. It's a safe bet that those who enjoyed America the Beautiful at Disney's theme parks (where it played for decades) would dig this film, too. Cinerama Holiday comes packaged in a standard Blu Ray-sized plastic package with Blu Ray and DVD discs arranged in a figure-8 on the right side; 28-page booklet on the left. The double-sided DVD edition contains the feature on one side and bonus content on the flip. When opened, the clear packaging shows a Las Vegas poolside vista from the film printed on the inside paper. 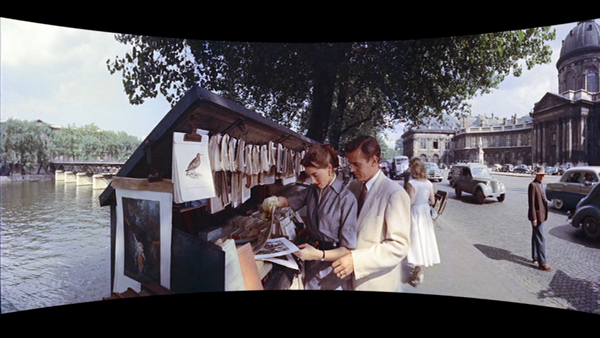 Cinerama Holiday is transferred to disc in a modified letterboxing format which Flicker Alley calls Smilebox. While the right and left sides take up all the vertical space on a 16x9 screen, the center is bowed inward to reflect how it was originally screened. This results in some vertical squeezing on the sides - a slight a distraction which becomes less noticeable as the film unspools. The restoration job looks fantastic. 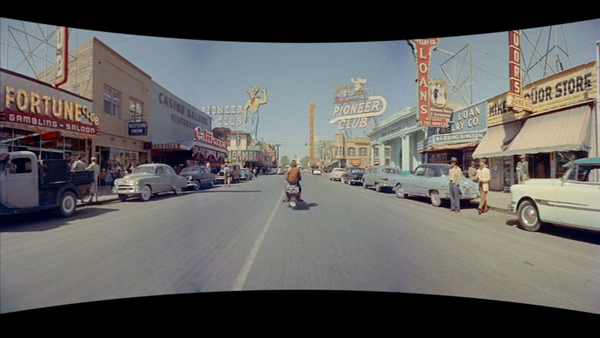 Since Cinerama films were shot on a larger negative, there's not as much grain as seen in other color films of that era. The color seems a little faded, and there's some discoloration in areas where the three film elements "join" together, but for the most part it's a lovely looking transfer. Cinerama Holiday underwent a restoration with its soundtrack as well. The Dolby 2.0 Stereo mix shows its age at times, but is generally pleasant and pristine. The default option here is a Dolby Digital 5.1 surround mix, containing a strong central channel with occasional sound effects and music coming from the sides (especially noticeable in the scene where John and Betty Marsh visit with a typical French family). No subtitles are provided. Cinerama Holiday comes with about 120 minutes' worth of thoughtfully produced featurettes, which include interviews with the two young women featured in the film. Breakdown Reel (14 min.) - whenever the Cinerama system broke down, theater exhibitors had a back-up reel on hand to show while the film was being repaired. This unvarnished yet fascinating film has John and Betty introducing and narrating the other stops on their European adventure. Cinerama Holiday at the Dome (6 min.) - footage from the April 2013 premiere of the restored Cinerama Holiday at the Cinerama Dome in Los Angeles. This includes part of a Q&A hosted by Leonard Maltin with the two ladies from the film (who don't seem to have aged much at all). 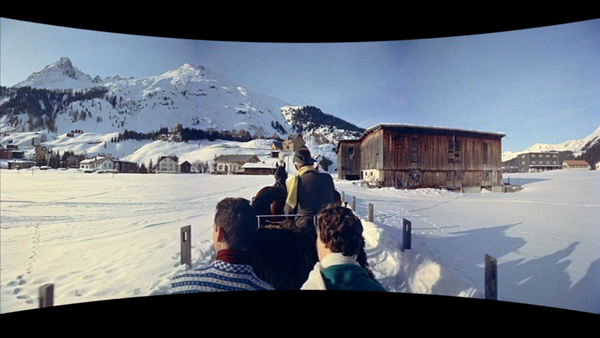 Return to Cinerama Holiday (22 min.) - retrospective documentary with Betty Marsh and Beatrice Troller sharing memories of making the film with their then-husbands (both deceased). Contains some intriguing behind-the-scenes stuff, not the least of which is the revelation that the women had no idea what Cinerama was until they saw the film-within-a-film captured in the feature. Betty's Scrapbook (11 min.) - "Share a fascinating look with Betty Marsh as she rediscovers memories of the film with a newly uncovered 50-year-old scrapbook of the production." 1997 Cast Interview from Cinerama Holiday (22 min.) - an interview with the four cast members, taped when the film had its first, unrestored re-release in the '90s. Deleted Scenes from Cinerama Adventure (8 min.) - an excerpt from the documentary Cinerama Adventure dealing with the production of this film. 8MM Home Movies (15 min.) - "Shot on the French and Swiss locations during the filming of Cinerama Holiday." Restoration of Cinerama Holiday (13 min.) - This featurette delves into the extensive digital restoration done by the Image Trends company to bring the film back to its original, non-degraded glory (amazing stuff, really). Slideshow: Behind the Scenes with Cinerama Holiday (7 min.) - photos from the production, backed with some of Morton Gould's musical score. Lastly, the package comes with a booklet reproducing the original program that viewers could obtain at 1955 screenings of Cinerama Holiday (lucky them). This 28-page goodie contains background info on the production, an article and graphic explaining the Cinerama process, even a recipe for the cheese fondue consumed in the film. I find this kind of stuff so fascinating - Flickr Alley deserves a huge "thank you" for including it. 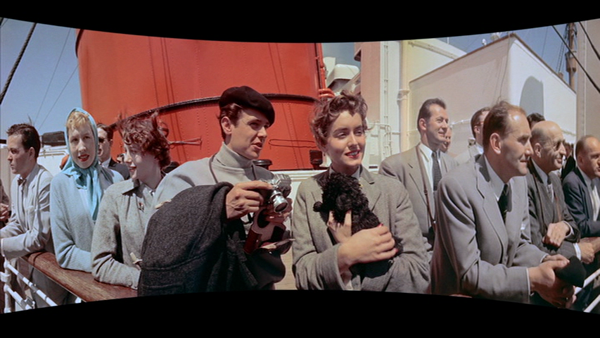 Cinerama Holiday captures the glamour of 1950s travel in luxuriant, sometimes quaint but always fascinating style. Although watching this travel documentary on your home screen can't fully recapture the original big-screen experience, Flicker Alley's thorough restoration and feature-packed Blu Ray edition makes it a terrific package. Highly Recommended.